The Star (DH plot spoiler at link!) 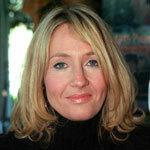 continues on to note J.K. Rowling emphasized the information was revealed because she was asked a direct question about it, and said “she didn’t feel the need to be explicit about Dumbledore’s sexual preferences because she wanted to focus on character development. Rowling said Tuesday she found it “freeing” to out Dumbledore, adding that the passages about him will mean different things to different readers. “I think a child will see a friendship and I think a sensitive adult may well understand that it was an infatuation,” she said. Update 3: Photos of Jo from the press conference in Toronto, Ontario Canada are now up in our galleries, here.